Daily Mail report and brilliant photos HERE. We were in the Financial Times, the Metro, on BBC News at 6 & 10pm then also the next day. managed to grab the media attention. 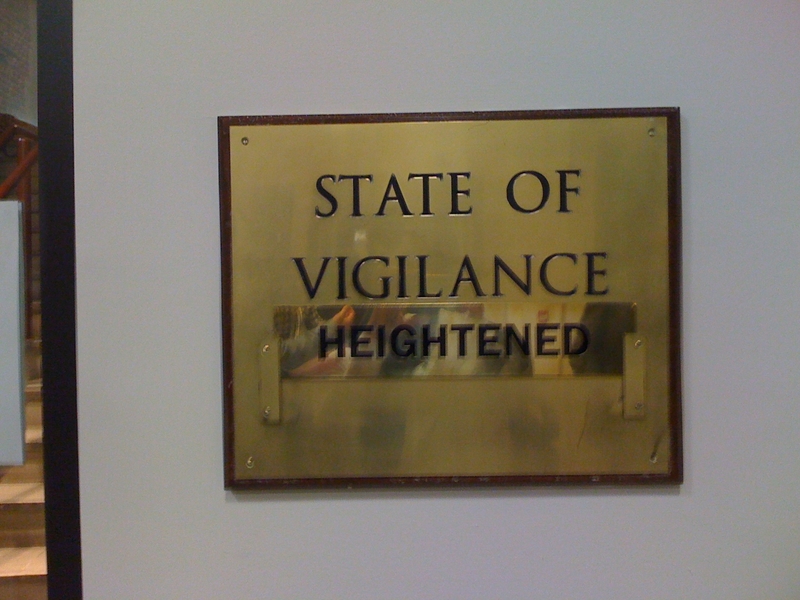 This photo I took inside 70 Whitehall demonstrates, perhaps, how scared the government are at the moment. 12 students from higher education and school students were invited to ‘discuss developing policy on the future of Higher Education Funding’ on the day that the coalition government released their report on education cuts. He invited me, Clare Solomon, and 11 other education representatives, all of whom have colleges in Lib Dem constituencies, to what I can only describe as a sham consultation. At 12.30 he released his report into the Brown Review. We were to meet him at 1pm. This gave us no time to download, digest and analyse the content therefore making a mockery of his attempt to pass off the meeting as though he had discussed it thoroughly with us. 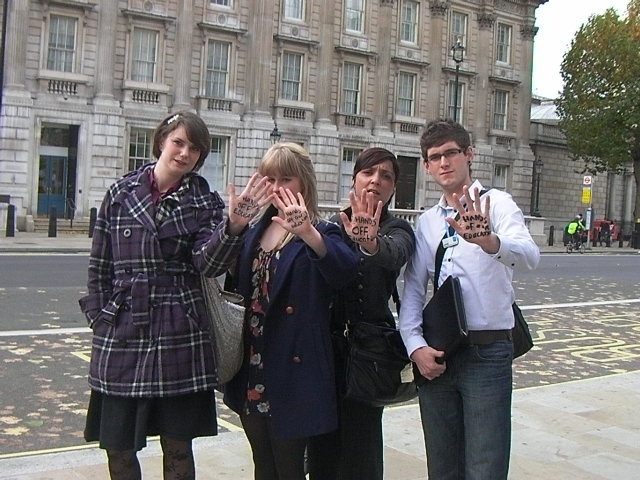 Prior to the meeting we decided to write Hands Off Education on the palms of our hands a couple of us wore t-shirts with slogans on them underneath our regular clothes and managed to get past security with them concealed. When Clegg invited the BBC to do a 3 minute panoramic shot of him looking cosy with students I was able to remove my shirt and tie and expose the message “Remember, Remember, the 3rd of November: The Coalition Government Plot Blows Up Education’. His minders quickly tried to hide my striking t-shirt by surrounding me but I kept moving and waving my palm in the air. This set the tone of the meeting, at which all students were very angry with Clegg, his bogus meeting and his defending of the massive cuts to education that he and his party are supporting. We demanded to know why the LibDems broke their manifesto promise of removing fees. Clegg said ‘you may live in a bubble but in the real world we have no alternative; what’s YOUR alternative then?’ he asked!! What a cheek. We told him to stop allowing companies like Vodaphone to dodge taxes, to halt the 55% pay increases for the bosses, to implement a progressive tax system across society, to stop funding war and Trident. He said ‘that is complete nonsense’!! Elliot from Leeds Uni brought up the fact that Muslim students may not be able to take out loans because of the interest that is associated with the loans so large swathes of people will also not be able to afford the fees. Elliot also pointed out that since education benefits the whole of society not just the individual who receives it (an educated society is more likely to vote, to have lower infant mortality, is more healthy etc etc) and that, therefore, it should not be the individual that pays. We need to push for progressive taxation across the whole of society so that the rich pay more tax and the poor less. This is the only fair way to fund the best education system. See you on November 10th. Don’t forget the Big Demo and Breakfast at ULU from 8am, banner & placard making and student press conference at 10.15 all at ULU. Ask your coach to drop you at Mallet St.
Email campaigns@ulu.lon.ac.uk to book your breakfast. We have over 1,200 booked in so far so make sure you let me know asap. Well done Clare, love the videos, in particular the school students! Click the thing above for notifications of events, meetings and actions throughout the year. THEY CAME FIRST for the Communists, and I didn't speak up because I wasn't a Communist. Crypt Fest: ULU’s Central School of Speech and Drama Theatre performances this Saturday. We Won the Wardens – for this year. Tony Benn @ ULU, and Liam Burns NUS Pres, Sherelle Davids LSE Anti-Racism officer & others. Get Freedom for Palestine into the charts. Its our last chance – one final push! Buy now – This is the week that counts – Get ‘Freedom for Palestine’ into the charts! Who’s going to Glastonbury? Wanna meet?